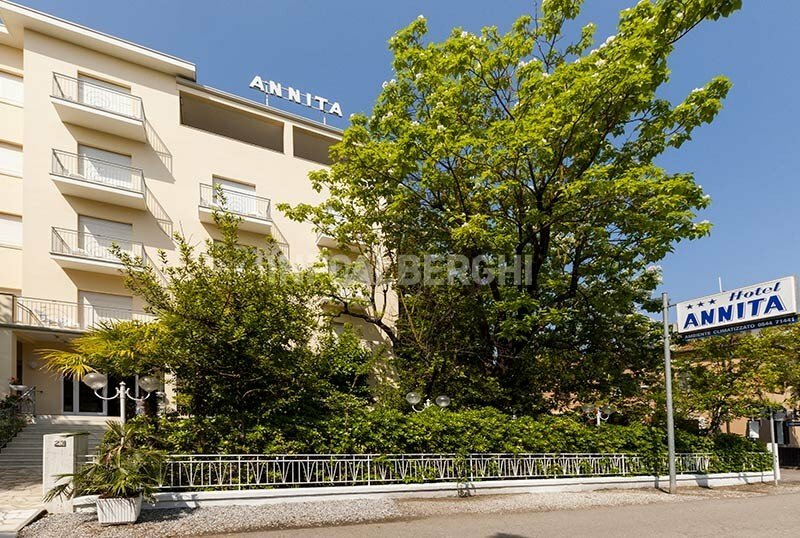 The Hotel Annita is a family-run 3 star hotel in Cervia, just a short distance from the sea and the canal harbor. Offers air conditioning, free WI-FI and parking. Accept small and medium-sized animals. The hotel is centrally located 2 minutes walk from the beach and the canal port of Cervia. Not far away is Milano Marittima reached by crossing the canal by ferry: the mooring is located near the structure. All rooms have a balcony (some with sea view), independent air conditioning, 32 "satellite TV and digital terrestrial, WI-FI, safe, telephone, minibar and bathroom with hairdryer and shower. FAMILIES : communicating solutions are available or in triple / quadruple version for families and large groups. Garden, open-air porch and equipped terrace, free use of bicycles, reading room, elevator, free beach towel, laundry (on payment). The structure is equipped for cyclists. PARKING: uncovered and available subject to availability. WI-FI: available in the whole structure (including rooms). AIR CONDITIONING: available in the room at no extra cost. CONVENTIONS: beach, shuttle service available upon payment, organized excursions. BREAKFAST : international buffet breakfast with homemade cakes, fruit juices and savory dishes such as sausages. LUNCH AND DINNER : traditional romagnola with three choice menus, hand-pulled pasta and second courses of meat and fish. Meals are always followed by a buffet of appetizers and homemade desserts. VARIATIONS : vegetarian and gluten-free dishes on request. In the hotel : outdoor playground area. In the room : cots (on payment). At meals : seats at the table and baby menu. Homogenized are available on request. At the beach : entertainment service. The hotel has an agreement with the Bagno Sorriso bathing establishment n. 228, equipped with sunbeds, beach umbrella, private hot showers, bar, restaurant and mini club and playgrounds for children, bocce courts, basketball, foot and beach volleyball and free WI-FI. Prices shown are per person per day in a double room. Children free for 0 to 5 years! Book now! you can get a 5% discount on the total stay, contact us now! The Hotel is about 1 km from the start / finish of the race, possibility of internal storage of bicycles and equipment. Possibility to check out until 19.00 h of the day of the race.